All the Jila by Daniel Walbidi, who inspired his remote Kimberley community to take up art. A young man who inspired a world-class art movement from a remote Kimberley community is one of eight WA contenders for the richest Aboriginal art prize in the country. After taking up art as a 16-year-old, Walbidi inspired his Yulparija elders in their 70s and 80s to paint the stories of the ancestral desert lands they left more than 40 years ago to live at Bidyadanga, formerly La Grange Mission. Two years ago, he played a key role in the emotional homecoming of a group of the elderly artists to their traditional country in the Great Sandy Desert, which was the subject of the ABC television documentary Desert Heart. “I guess I am a pioneer, paving the way,” Walbidi says. “I have been helping a lot of people and I guess they have seen me as an instigator. The work of the old people has sparked a big art movement in the community and a revival of culture. Walbidi is one of 15 artists and one artists’ group chosen as finalists from the 213 nominations for the WA Indigenous Art Awards exhibition at the Art Gallery of WA. Launched by the former Labor government, the awards are in their second year but have an uncertain future after Arts Minister John Day indicated recently they might be held every second year. Announcing the finalists this week, Mr Day said the increase in nominations from the 157 received last year showed the awards had gone from strength to strength. His spokesman said a decision would be made later this year. The $50,000 main prize and a $10,000 award solely for WA artists will be announced when the exhibition opens on July 24, with a $5000 people’s choice award at the end of the exhibition. 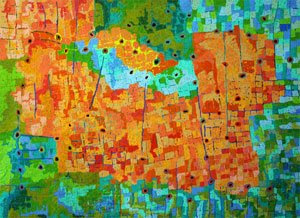 WA painter Patrick Tjungurrayi won the major prize last year. This year’s event is notable for the greater presence of sculpted objects after last year’s finalists comprised mainly paintings, drawings and prints, says Art Gallery of WA indigenous curator Clotilde Bullen, pointing to Thursday Islander Ricardo Idagi’s masks, baskets created from discarded metal by Victorian artist Lorraine Connelly-Northey and East Arnhem Land artist Gali Yalkarriwuy Gurruwiwi’s feather-adorned poles. “There is such a really wide and diverse range of works and objects,” Bullen says. “We have really built up the momentum from last year.” The other 2009 finalists are: Tony Albert (Queensland); Timothy Cook (NT); Nici Cumpston (SA); Brian McKinnon (WA); Doreen Reid Nakamarra (WA); Yinarupa Nangala (WA); Dennis Nona (Queensland); Tiger Palpatja (SA); Christopher Pease (WA); Shane Pickett (WA); Spinifex Artists Group — Women’s Collaborative (WA); and Wakartu Cory Surprise (WA).